Youth Mountain Biking is thriving in the Shenandoah Valley. The SHEN-ROCK Team operates under the Shenandoah Valley Bicycle Coalition and is about to start up the Spring 2019 Season. Our spring season is open to all Middle and High School Students grades 6-12 AND elementary school students who are 9 years old by April 1, 2019. 3/14: Meet & Greet/Signup Deadline on Thursday, March 14 at 5:30 pm in Shenandoah Bicycle Company. 3/21: First SHEN-ROCK Practice of 2019 at Massanutten’s Western Slope and practices are every Tuesday and Thursday until early June. SHEN-ROCK Rides are open to any interested riders. Weekly rides fall under Shenandoah Valley Bicycle Coalition group rides and as such are open to any member of the SVBC. Any guest rider must sign a waiver and is allowed one ride as a guest. To attend a second time, the guest must join the SVBC. Youth participants with the SHEN-ROCK Team will NEVER be REQUIRED to race. Opportunities to race will exist in the spring and fall leagues but racing is NOT a requirement to join in on weekly rides. 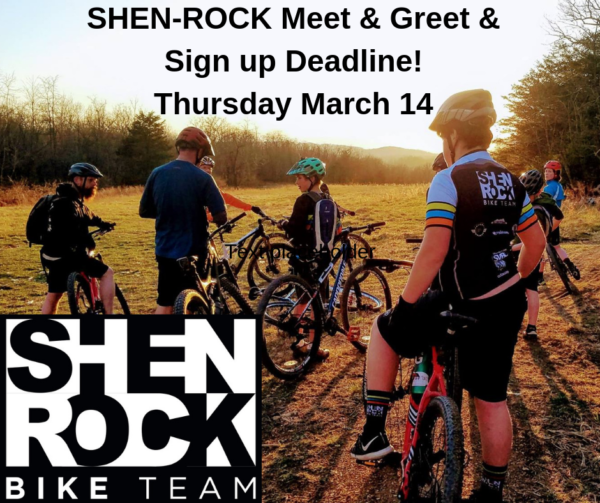 SHEN-ROCK will NOT hold tryouts and aims to be an inclusive team that welcomes all interested riders provided they contribute to a safe and productive riding environment and follow directions and guidelines as laid out by coaches.